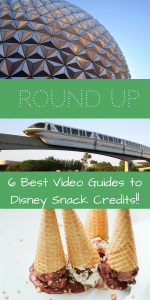 ROUNDUP: The 6 Best Video Guides to Disney Snack Credits! Did you get a Disney Dining Plan? Thinking about getting one? Learning a little about the dining plan before you go, about the options and how to utilize the plan will enable you to spend less out of pocket while you are there which can really help manage your expenses! 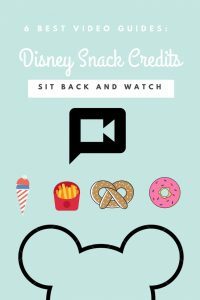 The Disney Snack Credits – you will get 2 per day – can go a long way if you choose substantial items. Lots of pros have combed the parks for the best options! There’s no need to reinvent the wheel here! As such I have reviewed the pro’s videos and consolidated the ones I thought best went over the options to (1) get the best values, most food for your buck (2) make recommendations for the best tasting options and (3) use snack credits for breakfast. And if you have your own video you think should be in this list please reach out to me! I also have a great All Things Disney Pinterest Board with TONS of great planning articles!! From Hotel Reviews to Fast Pass Strategies to How to Meet the Characters to other Disney Property/Cruise Planning! Also check out my recent post on Keeping Cool in Disney Parks! SNACK CREDIT CHALLENGE FOR BEST SNACK IN THE PARK!